Manage Client-side and Server-side Rules? 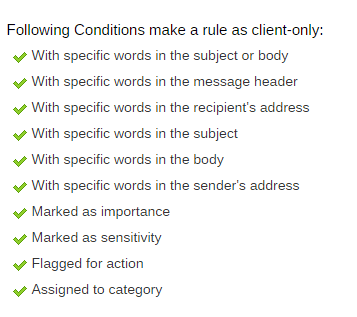 Rule can be defined as an action which MS Outlook takes up automatically on arriving specified email or on sent message according to the conditions which you have set on the rule. When you create a rule it will be either server-side or client-side and it depends on the rule message you create with the selections of conditions, actions and exceptions. If the rule comprises of the actions, conditions, exceptions which can be performed by the Outlook then it is client-side rule. If it is also dependent on specific configuration of Outlook then it will add up the "on this machine only" condition. 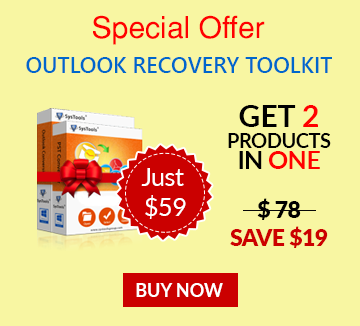 In this example <follow up at this time> is an Outlook feature and server i.e. Exchange will not be able to process this rule. This rule is therefore a client-side rule. 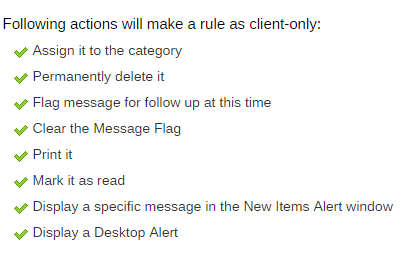 And thus the rule will follow up when Outlook is started and messages are synched with Outlook. If the folder to which message has to be moved is within the Exchange mailbox and belongs to the Exchange and the sender's name is in GAL or in Contact's folder then, the rule is server-side rule and information will be saved on the Exchange itself. What is "On This Machine Only"? This condition is same as second example but if the folder which is specified is in PST file then rule will be marked as "On this machine only". This has got an obvious reason that PST file will be part of a particular system configured in it. So this rule will execute only on that system. How is Client-only or Server-side Rule Executed? When you create a rule and provide certain specifications with this rule, the Rule Wizard stores these settings (conditions, actions, and exceptions) in an .rwz file. This file name has a same name as it is of the user's profile to which account belongs. Rules applied for incoming messages, it will store that information in INBOX folder itself and the details of rule are available to the server also. When any email arrives, server will first compare it with the list of rules and the server can execute the rule, it will do so. If it is not capable to run the rule, it places a deferred action message (DAM) in a hidden folder i.e. "Deferred Action folder" in the mailbox. Now when user runs Outlook, client first checks the Deferred Action folder and examines each DAM. If rule belonged to current profile which is running on Outlook, it will carry out actions indicated in DAM. This is why sometimes rules get fired in unusual order. Conclusion: The section above explains types of rules, their executions and list of actions, exceptions, and conditions of client-only rules. There are some rules like the rules which have been created for POP3 and IMAP accounts are always client-side rules. This means that MS Outlook must be always running so as to process the rules. If you want to execute the rules even when MS Outlook is closed for IMAP and POP3 account then you need to log-in to web-based client to configure rules there. It must be taken into consideration that if your mailbox is full, rules might not be executed well. So if your rules are not working or giving errors, you must check the mailbox size.